As debate in China's centre is stifled, Hongkongers fear for their future – with good cause. Is there a connection between the uneasy quiet at the centre and the trouble at the periphery? Most likely, there is. While young Hong Kong demonstrators crowd out the financiers in the centre of the city and in full view of the world’s media, bloody actions and an even bloodier repression is striking Uyghurs in Xinjiang, far out of sight. Trouble on the periphery contrasts with the apparent quiet that has descended on China’s main political scene – although spanning these separate spaces, Ilham Tohti, a mild, peaceful Beijing academic, has just been sentenced to life in prison for his work defending human rights for Uyghurs. The quiet way that political events are unfolding on the main political scene is starkly different from the way things were only three years ago. At that time, divisive issues at the core of the Communist Party resonated in public, from debate on a new criminal law to the Bo Xilai corruption case, and succession politics was the name of the game. Only 50km from the border with Hong Kong, peasants were staging a successful protest against land grabs by local officials and their cronies – but who today remembers the name of Wukan, which made front-page news in the international media in 2011-2012? Today, all constitutional and political debate has been silenced (a plenary meeting on legal issues has been announced for next month, but it would be misleading to say that the meeting will be about the rule of law). An extensive and targeted anti-corruption campaign is in full swing, but it has had almost no publicity and few details have been revealed about the cases, which are being dealt with by the party-state apparatus. Even the purge of a key political actor, China’s former security czar Zhou Yongkang, has only been confirmed by rumours and a one-line communiqué. Observers have begun to accept what was already becoming apparent by mid-2013 – Xi Jinping has firmly grasped the handle of power; he does not intend to share it; and on every political issue, his stance is as firm as it is open, or even waffling, on economic policy. Is there a connection between the uneasy quiet at the centre and the trouble at the periphery? Most likely, there is. The Chinese state has responded with an iron fist to the attempts of some Uyghurs to take their struggle further inside China – including an amateur suicide squad on Tiananmen Square in October 2013. Over the last few months, terrorist acts in Xinjiang have been met with a much larger scale repression. Although exact figures are hard to verify, the death toll runs into the hundreds, after the People’s Armed Police have indiscriminately fired on people in the province. It appears that events in the Middle East – from Gaza to the rise of the Islamic State – have been used as a protective shield by the Chinese authorities, who expect to be given a pass by embattled Western governments. A violent spiral has been ignited, with international consequences: Uyghurs are radicalising and joining the international Jihad, making the official claims of the Chinese government into a self-fulfilling prophecy. The situation in Hong Kong is infinitely more nuanced. Yet it seems that this is not so much a crisis of unmet expectations as the expression of a deep anxiety by Hong Kong residents about their future. Exactly like in Taiwan, where earlier this year the Sunflower Movement erupted (directed against a trade agreement on services with the Chinese mainland), middle-class youth are at the centre of the movement in Hong Kong, and particularly the student class, which is the product of school selection. Overall, pro-democracy parties get more votes in central Hong Kong and Kowloon than in the New Territories. For Hong Kong as for Taiwan, there are two clear messages from China’s peculiar globalisation. The first is that the smaller territories can expect to be overrun by competition and money from China proper. In Taiwan, the trade agreement on services promises to bring about lower wages in the services sector – and factory workers long ago lost out to investment in the PRC. In Hong Kong, locals are being crowded out by 20 million PRC tourists a year and by the huge rise in real estate prices set off by mainlanders with high purchasing power – and the situation particularly affects those who are just beginning their active working life. The second message from Chinese globalisation is to expect dwindling political franchises in the near future. The rewriting of school curricula in a fashion more compatible with future PRC rule encouraged the growth of the student movement in Hong Kong two years ago. In Taiwan, President Ma Ying-jeou’s rapprochement with the PRC, even as China’s increasing military might makes Taiwan independence a totally unrealistic prospect, sent young people out into the street. 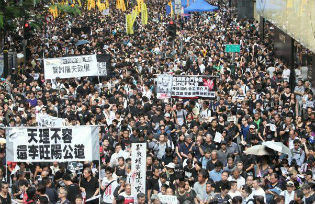 And whatever the outcome of events in Hong Kong, it is sure to reverberate deeply in Taiwan. There is a French saying that “one only exits ambiguity at one’s own disadvantage”. This is exactly the situation in which Xi Jinping and his colleagues now find themselves. The 1984 agreement on the return of Hong Kong, with its 50-year lease for “one country, two systems”, was always ambiguous. For one thing, it pushed the final arrangement 50 years into the future – the very same method that Deng Xiaoping used to defuse the island issue with Japan, which has now blown up in both countries’ faces. Moreover, the terms of the agreement were highly ambiguous about the changes that could be made during the transition period (the British are in part to blame for only making a stand for full democracy in the final years before 1997, but it is doubtful that they could have obtained more from Beijing in any case). The idea that Hong Kong could have a full direct democracy, combining a freely elected Legislative Council (LegCo) and chief executive, was always a fantasy as long as one party rule prevails in China. There is a very strong democratic current in Hong Kong, as is visible every year at the mass vigils held in memory of Tiananmen victims. But Beijing has been rewarded for its concessions (such as slowly increasing the proportion of directly elected LegCo seats) by the pro-Beijing (or pro business…) parties managing to claw their way back to a majority. The central authorities have relied on business and on indirect means (including intimidation) rather than on direct action to contain the obvious gap between the internationalist and outward-looking Hong Kong public and China’s stodgy political system and ideology. However, politics is about expectations. Beijing’s past concessions, including the announcement of a direct election for Hong Kong’s chief executive in 2017, are now capped by its reliance on a poorly legitimised electoral committee to select candidates: Hongkongers were given the option to veto a candidate, but not to vote for one of their own choosing. A possible way out still exists, for example extending universal suffrage (or a mixture thereof, as with the LegCo) to this electoral committee. But even concessions like this will not solve the basic conundrum: it is impossible for Hong Kong to have a political leadership that contradicts the basic rule in China – the rule that will prevail in any case after 2047. China’s leaders have no plans to fade out. Hong Kong – which has benefitted immensely from its proximity to China – can insist on the implementation of the Basic Law until 2047, and can plead for autonomy in many ways. But the more it openly makes claims to have its own political personality, beyond the right to protest, the more it risks a catastrophic clash. Other governments must not give Hongkongers illusions that will only lead to a Tiananmen-like ending. They must also point out to the central government the political advantages of compromise and the sky-high cost that real repression would entail. These are concrete goalposts – and European diplomacy should stay within them. François Godement is Professor of political science at Sciences Po in Paris, Director for strategy of Asia Centre, also in Paris (www.centreasia.eu), Senior policy fellow of the European Council on Foreign relations (www.ecfr.eu), and non resident Senior associate of the Carnegie Endowment for International Peace (Washington). He is also an outside consultant to the Policy Planning Directorate of the French Ministry of Foreign Affairs.